There aren't quite enough DSi owners around yet to justify Vicarious Visions adapting their portable version of Guitar Hero to work with Nintendo's latest portable, the developers told Kotaku this week. While Guitar Hero: On Tour requires a "Guitar Grip" peripheral that plugs into the DS' Game Boy Advance slot, the soon-to-be-released Band Hero also makes use of a rubber drum skin that slips over the portable. 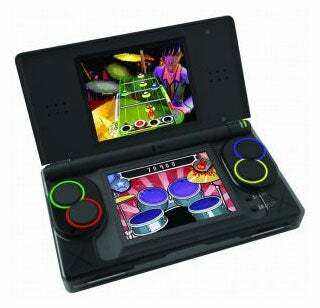 The skin features four tiny color-coded drum pads that tap on the DS' face buttons when a gamer uses them to play drums. The skin won't fit on the DSi because it's not the same shape as the DS, but the only issue is a form factor one. "It's something we want to work on and we have been investigating ways to get (Band Hero) to the DSi," said David Nathanielsz, executive producer at Vicarious Visions. "But we looked at how many people already have the Guitar Grip and already have the DS and not the DSi." Vicarious Visions said that both the drum and Guitar Grip peripherals compatibility issues with the DSi are "solvable problems," but not something they're committed to yet. Band Hero is set to hit the Nintendo DS, Wii, Xbox 360, PS3 and PS2 this November.